Kotka is a city and municipality of Finland.Kotka is located on the coast of the Gulf of Finland at the mouth of Kymi River and it is part of the Kymenlaakso region in southern Finland. On the 17th (Sun), steep yourself in history at Langinkoski Imperial Fishing Lodge Museum and then admire the natural beauty at Sapokka Water Garden. 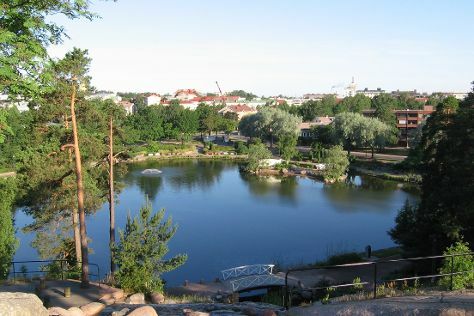 To find traveler tips, ratings, reviews, and other tourist information, read Kotka trip planner. Tallinn, Estonia to Kotka is an approximately 5.5-hour car ride. Expect a daytime high around 3°C in November, and nighttime lows around -1°C. Wrap up your sightseeing on the 17th (Sun) early enough to drive to Turku. Start off your visit on the 18th (Mon): browse the different shops at Turun Kauppahalli, explore the ancient world of Aboa Vetus & Ars Nova, then examine the collection at Luostarinmaki Handicrafts Museum, and finally browse the collection at Turku City Library. On the next day, take in the spiritual surroundings of Turku Cathedral, then get engrossed in the history at Ett Hem Museum, then step aboard Forum Marinum Maritime Centre, and finally step into the grandiose world of Turku Castle. For photos, traveler tips, more things to do, and other tourist information, use the Turku tour itinerary planner. Drive from Kotka to Turku in 3 hours. Alternatively, you can do a combination of bus and train; or take a bus. November in Turku sees daily highs of 5°C and lows of 0°C at night. Finish your sightseeing early on the 19th (Tue) to allow enough time to travel back home.